every so often, i'll hear people talking about the great food (often, burgers) at bandera, a restaurant located right on michigan avenue ... in the middle of all the shopping hubbub. so one saturday afternoon, josh & i decided to join the tourists on the mag mile for a little eating & shopping. bandera is self-described as a place of "casual sophistication & quality service." great. let's go. 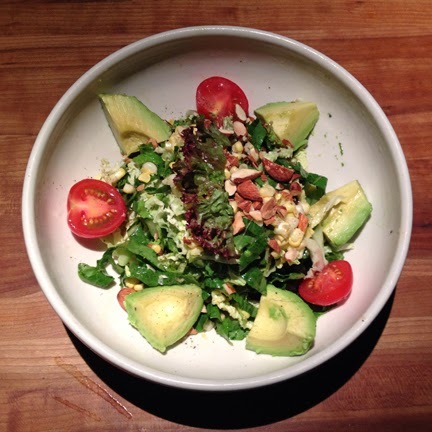 avocado, tomatoes, dates, almonds & corn w/ champagne vinaigrette. for me, when shopping -- i prefer to eat light. no food babies. so a salad was just what i needed. this one has tons of delicious & fresh ingredients ... even some avocado & almonds for a smidge of protein. perfection. oh, and the champagne vinaigrette it comes with? already vegan. so ... chicagoans & chicago tourists ... shopping on michigan? stop in at bandera for lunch. no buyer's remorse here. tenerife, canary islands, spain : restaurant 88.
union sushi + barbeque bar.